Sacred Heart Area School has planned its 2013 spring field trips for students and staff. On May 17th, our 3rd – 6th grades will be traveling to St. Paul. 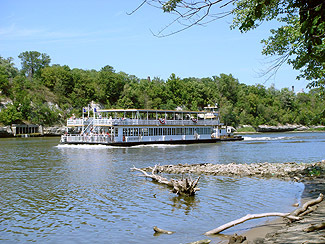 After a sack lunch along the Mississippi River, students will board a Padelford Riverboat for a 1.5 hour excursion (12:00-1:30pm) up and down the river. The next stop is the historical Kelley Farm of Elk River, MN. The boys and girls will step into a working 1860’s farm. On their 2 hour (2:30-4:30pm) tour, they will visit the farm house, the farm yard with animals, and possibly work the field. The approximate departure time from school will be 8:20am. The approximate return to SHAS will be 6:30pm. Parent chaperones are welcome. To learn more about these destinations, click on their blue highlighted titles linked to their websites. On May 22nd, our Preschooler – 2nd grades will be off to (as was part of the May 17th field trip) the historical Kelley Farm of Elk River, MN. The boys and girls will step into a working 1860’s farm. On their 2 hour (12:00-2:00pm) tour, they will visit the farm house, the farm yard and out buildings with animals, and possibly work the field. The approximate departure time from school will be 9:00am. The approximate return to SHAS will be 4:30pm. Parent chaperones are welcome. To learn more about this destination, click on its blue highlited title linked to its website.